Scott Greenstein, the Sirius Radio executive who agreed to pay half a billion dollars for Howard Stern. Just across the river‚ Hudson County offers excellent views‚ an easy commute and good real estate values. Find your dream home today! uring his career as a merger-and-acquisitions lawyer and independent-film executive, Scott Greenstein, a one-time protégé of both Harvey Weinstein and Barry Diller, told colleagues and potential deal partners, "I'm your guy." He was the guy who said he could get the stars, get the money, and get the movie deal closed. Sometimes, he delivered; sometimes, he did not. But last week, Mr. Greenstein, 45, became the alpha guy of the entertainment business, if only for a day or two. As president of sports and entertainment programming for Sirius Satellite Radio, he was integral to the luring of Howard Stern from commercial broadcast radio to the subscription-based Sirius. Backed by Sirius's significant coffers, Mr. Greenstein and Don Buchwald, Mr. Stern's agent, hammered out a deal worth $500 million in fees and production costs over five years. The news was heralded as a transformational moment for the fledgling medium of satellite radio, promising a possibly profitable convergence of content, data transmission, consumer electronics, and, of course, celebrity. It also instantly bolstered the perception of Sirius from that of money-losing also-ran to a formidable competitor to the industry leader, XM Satellite Radio. "It feels like the biggest media personality deal ever; it feels like the biggest radio deal ever; and it feels like it has the nerve center of America paying attention to media deals," Mr. Greenstein said last Friday. That tremendous confidence - or perhaps hubris - comes in part from his experiences working for Mr. Weinstein, the co-chairman of Miramax, and Mr. Diller, a longtime movie and television executive who is concentrating on interactive commerce these days. "What I learned at Miramax is that if you see where extraordinary creative talent can be brought into the family, move quickly, because if you don't, someone else will," Mr. Greenstein said. "What Barry Diller taught me was very special, and that was how unique and valuable content can be." Mr. Greenstein shares another trait with the two men: he's a polarizing figure, thanks in large part to the aggressive ways he conduct business. A native of Freehold, N. J., Mr. Greenstein joined Miramax Films in 1993, shortly after the Walt Disney Company bought the company from the Weinsteins. Mr. Greenstein's skills in deal making and acquisitions were needed at Miramax, which was about to step up production and distribution operations. By the time he left Miramax in 1997, Mr. Greenstein was known as "the third Weinstein brother." Mr. Weinstein declined an interview request, but released a statement praising Mr. Greenstein as "a true innovator and pathfinder." "What people at Miramax admired about Scott was that he would do the impossible for Harvey," said Peter Biskind, the author of "Down and Dirty Pictures: Miramax, Sundance, and the Rise of Independent Film" (Simon & Schuster, 2004). "If Harvey said, 'Fly to the moon,' Scott would find a way to do it. With the Howard Stern deal, that's very much in evidence." There is no love lost between Mr. Greenstein and Mr. Biskind. In the "Down and Dirty" book, some of the descriptions assigned to Mr. Greenstein include "hatchet man," "attack dog," "terrier on speed," and "crime scene laundryman who wipes the blood off the walls." Mr. Greenstein said: "Biskind was out to get me because I wouldn't dish dirt on Harvey and Bob and Diller. I refuse to cooperate in any story where Biskind is mentioned because I don't want to see him make another cent off a book that is full of inaccuracies." When informed of Mr. Greenstein's comments, Mr. Biskind said: "My book is accurate. And Scott cooperated with me on the book. He just didn't go on the record." Mr. Greenstein's tenure in the independent movie world was eventful. At Miramax, he negotiated the deal that brought "The English Patient" to the studio. In 1997, Mr. Greenstein left to become co-president of October Films, another independent known for films like "The Apostle." By 1999, Mr. Diller had purchased October, combining it with other companies to form USA Films. Mr. Greenstein, who had little equity in the company, was made chairman, and two minority shareholder owners, one of whom was a co-founder of the company, were fired. Mr. Diller, currently the chairman of InterActiveCorp, declined, through a spokesman, to comment. But in "Down and Dirty Pictures," Mr. Diller said he chose Mr. Greenstein to run USA Films because "he will go anywhere, knock down any wall, call anyone, do anything, and I'm an admirer of that." An example of Mr. Greenstein's aggressiveness can be seen in his outbidding others for rights to Steven Soderbergh's "Traffic," which became a box-office and critical hit. But three years later, Mr. Greenstein was out of a job, after clashing with other executives of the owner at the time, Vivendi Universal. Mr. Greenstein began looking for media deals to do on his own. After a brief pairing with Stanley Jaffe, a former Paramount Pictures chairman, which ended after their attempted acquisition for Artisan Entertainment failed, he went to work with Apollo Partners, a private equity group and a major backer of Sirius. Mr. Greenstein quickly signed Maxim magazine, the rapper Eminem, the National Football League, and the National Hockey League to programming packages. By July, he was meeting with Mr. Buchwald in what began as talks about Sirius's supplanting XM as a sponsor of Mr. Stern's morning show produced and syndicated by Viacom's Infinity Broadcasting. A month ago, he and Mr. Buchwald started negotiating the price for moving Mr. Stern's show to Sirius. Amir Malin, a former co-owner of October Films who has kept in touch with Mr. Greenstein over the years, lauds Mr. Greenstein's deal-making but offers some cautionary words. "It's a great deal for Scott, because it's not his money, and, if it works out with Howard Stern, it's a genius deal," said Mr. Malin, the former chief executive of Artisan Entertainment, which he recently sold to Lions Gate Films. "If it doesn't work out, Sirius is in bankruptcy. There are no shades of gray here. It's do or die." According to Mr. Malin, the math is simple: Sirius has committed itself to pay Mr. Stern's operations a yearly fee, $100 million, that is almost eight times Sirius' current yearly gross revenue figure. Mr. Greenstein repeated the company's stock response: if a million of Mr. Stern's fans pay $12.95 a month, the deal will pay for itself. Special Offer: Home Delivery of The Times from $2.90/week. Market Place: Ahold Reaches A Settlement With the S.E.C. 10% off Dell Desktops and 15% off Notebooks! 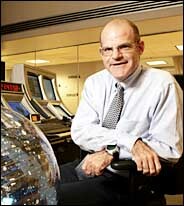 OS ANGELES, Oct. 5 - Before the outcry and the lawsuits, Barry L. Hirsch could have taken the easy path into retirement. Earlier this year Mr. Hirsch, the 70-year-old show-business lawyer whose clients include Julia Roberts, Jennifer Lopez, Michelle Pfeiffer and Francis and Sofia Coppola, was offered what some would consider a generous retirement package by the younger shareholders in Armstrong Hirsch Jackoway Tyerman & Wertheimer, a premier entertainment law firm that Mr. Hirsch helped found here 24 years ago. Mr. Hirsch, the firm's chairman, was not being forced into retirement, said his fellow board members, many of whom he had recruited into the firm. But if he chose to stay on, they said, his multimillion-dollar annual salary would be reduced, he would have to share much more power in the realigned organization, and his personal expenses would be reined in. If he chose to continue working, Mr. Hirsch would have to acknowledge that he was "no longer the rainmaker at this firm, but, instead, a rainmaker," said James R. Jackoway, the president of the firm, now called Jackoway Tyerman Wertheimer Austen Mandelbaum & Morris. But since the rainmaker in question is the unconventional Mr. Hirsch - a licensed marriage and family counselor who officiated at Ms. Lopez's second wedding - there is no slow ride to Palm Springs on the horizon. The split has created a battle over money and clients (with some of Hollywood's most successful actors and directors caught in the middle), touched off dueling lawsuits among deal-making lawyers who usually stay out of the courtroom, and provided a spectacle for those who thrive on gossip about show business's bloody internal politics. As of last week, Mr. Jackoway confirmed, Ms. Lopez, Ms. Roberts, Ms. Pfeiffer, the Coppolas, the actors Bernie Mac and Owen Wilson and the director Wes Anderson were among clients who had jumped ship to the new firm, called Hirsch Wallerstein Hayum Matlof & Fishman. Speculation was rampant among fellow deal makers as to where the loyalties of other famous Hirsch clients, like the actor Jude Law and the directors Sydney Pollack and Barry Levinson, would ultimately lie. What makes this conflict unusual is that high-profile lawyers seldom make their wrangling as public as Mr. Hirsch and Mr. Jackoway have. Entertainment industry lawyers are usually considered to be the voice of reason, counselors who make wise decisions in their clients' interest while staying above the fray of internecine Hollywood business disputes. "Since I've been an agent, I've never heard of this kind of thing between big Hollywood lawyers," said Ari Emanuel, one of the founders of the Endeavor Agency. Mr. Emanuel was represented by Mr. Jackoway when Mr. Emanuel's former boss, Jeffrey Berg, chairman and chief executive of International Creative Management, caught him taking I.C.M. files just before he started Endeavor in 1995. That dispute was settled amicably, without litigation, according to an executive at I.C.M. Mr. Hirsch said the fight grew from his long-standing protests over what he called a change in culture at his old firm. "It turned into a business with a bottom-line approach rather than a business about serving clients," he said. "I tried to rehabilitate a dysfunctional firm and keep the clients out of any dispute. I want to solve my dispute amicably." So far, the proceedings have been anything but amicable. Papers filed in Los Angeles Superior Court by the Jackoway firm say that Mr. Hirsch and his colleagues collected their bi-weekly paychecks on Friday, Aug. 13, and, after the close of business, bolted. Over the next 36 hours, Mr. Hirsch and the partners who first joined him backed a truck up to their old offices, downloaded files from their office computers and removed miscellaneous office furniture and boxes filled with hard-copy client files, the papers say. By the following Monday, Aug. 16, Mr. Hirsch and his new team had hired a publicist and christened their new legal boutique down the street in the Century City neighborhood, and were urging clients from their old firm to jump ship. Also on that day, Mr. Jackoway and his fellow board members Alan S. Wertheimer, Barry W. Tyerman and Geoffry W. Oblath were served with a lawsuit that Mr. Hirsch and his new law partners had filed on the previous Friday. The suit states that Mr. Hirsch and the other plaintiffs had effectively been pushed out the door by a scheme that would have improperly diverted revenue and concentrated power in the hands of the defendants by converting the firm from a corporation into a limited liability partnership on Sept. 1. Legal issues in the dispute turn partly on whether Mr. Hirsch and his colleagues misappropriated trade secrets by what the Jackoway side calls "wild looting" of the firm's records. According to Gregory Keating, who teaches professional business practices at the University of Southern California Law School, disputes between lawyers over who owns what in a legal file are commonplace but often resolved without trial. "It's the client's right to control the actual work product in respect to attorney-client confidentiality," Mr. Keating said. Thus, if the clients whose information was in the files have switched to Mr. Hirsch's new firm, "it may not really matter that the old firm owns the actual paper that's in the file," he explained. A more colorful assertion by Mr. Jackoway and his partners is that Mr. Hirsch, with his training and skills in psychology, persuaded clients to switch representation for his sake rather than their own by making them feel sorry for him. "Hirsch used the psychological pressure points known to him as a therapist to manipulate their emotions," the Jackoway firm's court filing says. Mr. Hirsch, who has a master's degree in behavioral science from Azusa Pacific University, scoffed at that contention. "The idea that I'm some sort of Svengali who hypnotized clients to come with me is laughable," he said last week. "My clients are sophisticated business people perfectly capable of acting on their own free will." Challenging Mr. Hirsch's claim to have been squeezed out, Mr. Jackoway said in an interview that Mr. Hirsch "left secretly and without discussion because of his hubris and greed." A Yale Law School graduate, Mr. Jackoway, 52, represents David Letterman and Mr. Letterman's Worldwide Pants production company. He and his partners have a client list that also includes the actors Nicole Kidman, Cameron Diaz and David Caruso, the talk show host Jimmy Kimmel and the screenwriters Ron Bass, Brian Helgeland and Gary Ross. "My loyalty is not to any law firm, but to my individual lawyer, Alan Wertheimer, whom I've been with for 20 years," said Mr. Ross, whose screenplay for "Seabiscuit" was nominated for an Oscar last year. "I have to worry about making movies, so I'm not really that interested in the fight between Alan and the firm and Barry Hirsch." In the current troubles Mr. Hirsch, at least, sees a silver lining. "Instead of retiring, I still get to do what I love to do and do so well, which is represent clients," he said. "What does my age have to do with anything?" Mr. Hirsch said he had recently heard from many people over 45 who felt trapped in miserable jobs until they heard of his own exit from his old firm. "To borrow the words of Joseph Campbell from the 70's, I tell older people afraid of starting over to just follow your bliss," Mr. Hirsch said.